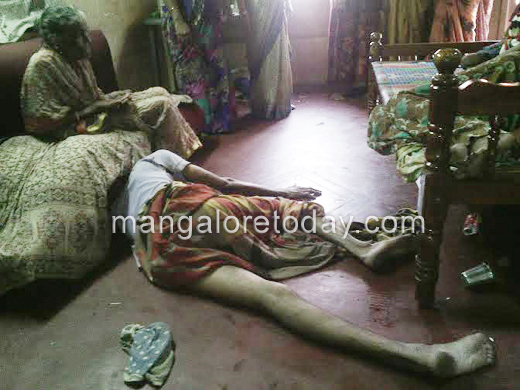 Mangaluru, May 21, 2015: Srinivas ((38), a resident of Kalpane Kakkebettu in Shaktinagar, the head of the distraught family of four which was rescued by the ChildLine and Women and Child Welfare Department just a couple of days ago, has passed away at Wenlock Hospital on May 20, Wednesday. His wife Mallika (32) still continues to be in a critical condition. ChildLine authorities have informed that the two children of the couple have been entrusted to the care of Prakash, the brother of Mallika. If Srinivas who had suffered a stroke was undergoing treatment since some time, his wife Mallika who was the sole bread winner of the house too was ailing since the past few days, leaving their two little sons aged six and four in a desperate state. Meanwhile, when no help came through to the family from relatives, neighbours informed the ChildLine following which the authorities rescued the family and shifted the couple to hospital. It has been gathered that the deceased Srinivas who was working in a liquor company earlier and had even constructed a small house had turned out to be an alcoholic. Though once he was cured of his ailment, he had again begun his old practice following which his wife Mallika was completely shattered and now continues to be in a critical state. It has been gathered that several kind hearted people have contacted the ChildLine with an intention of helping the two kids.